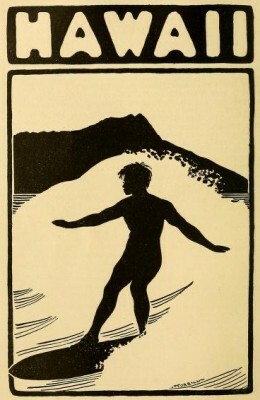 Surfing Images : Illustrations, 1788 to 1930. 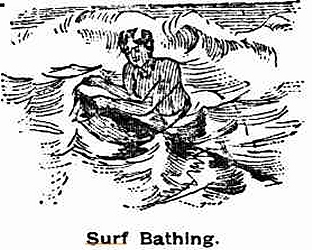 In the period leading up to the revival of surf-riding in the early twentieth century, images in common circulation (books, magazines or newspapers) were confined to two-tone wood blocks and etchings. This was because of the great expense in printing colour images and the technical problems in reproducing photographs. 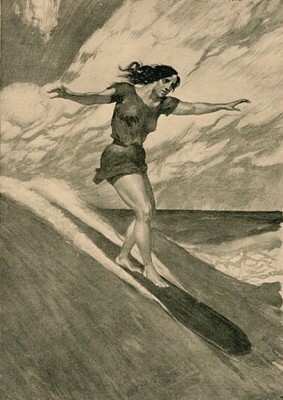 Most illustrations were printed in conjunction with published reports of surf-riding, which are generally brief but rich in detail and often enthusiastic. In only one case is the author and illustrator the same, see Ormsted (1841). 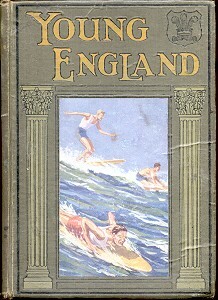 For other early written accounts of surf-riding, see Source Documents. 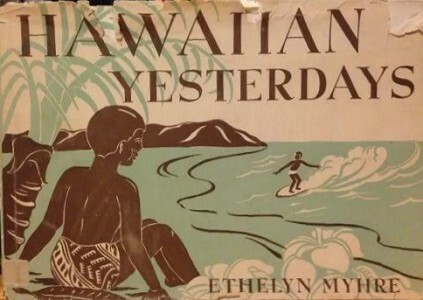 Utlimately, these published works could be considered as part of a developing Pacific tourist industry, exposing Western readers to the pleasures of Hawai'i. Images printed by etchings or woodblock and are usually the work of two artists which can lead to some confusion in attribution. I have been unable to credit some of the works below to my satisfaction. In many cases the images were printed in a number of editions and in various subsequent publications. They are often cropped or resized and appear with different captions. This is particually the case in modern printings, see Finney and Houston (1966) et. al. For the images I have attempted to select the earliest printed version. 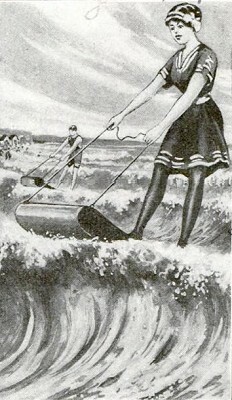 Alternatively, when available, coloured images have been selected or an example that shows the least evidence of cropping. It is often difficult to determine the location (which may not be the same as the accompanying report) and whether the image is constructed from the artist's personal observation or a reconstruction based on eyewitness reports. 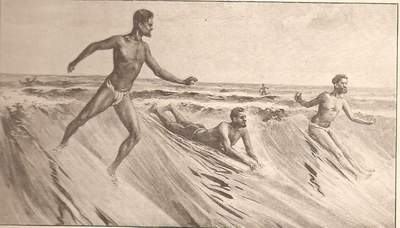 Images of surfriding were of varving quality and accuracy - most artists struggled with presenting the essential dynamics of the activity. This is most commonly seen in the difficutly of locating the board and rider in a realistic position on the wave face. 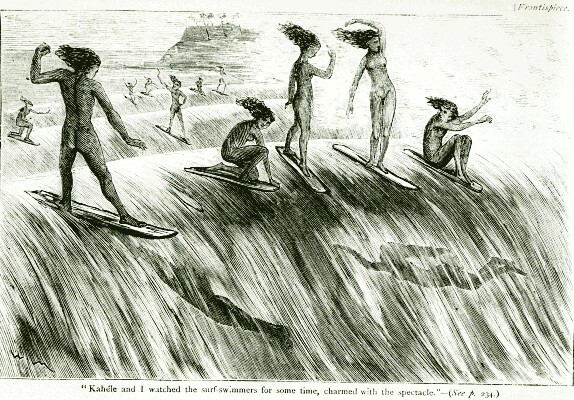 Bolton noted in 1891 ... "Some pictures ... represent the surf-riders on the seaward slope of the wave, in positions which are incompatible with the results." 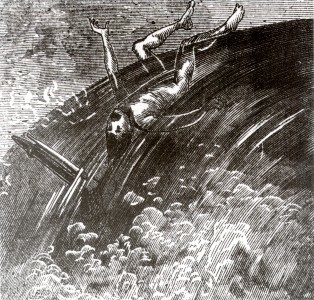 In images that were probably drawn from personal observation, some allowance must be made for a failure to comprehend the dynamics of wave-riding. 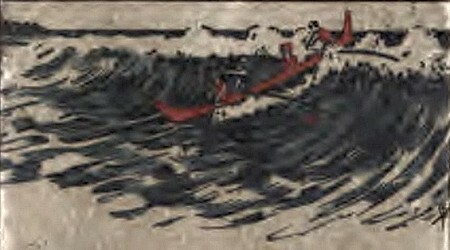 The riding (compared with the paddle-out) was rapid, the nature of the wave changed dramatically and it did not resemble contemporary Western activites. 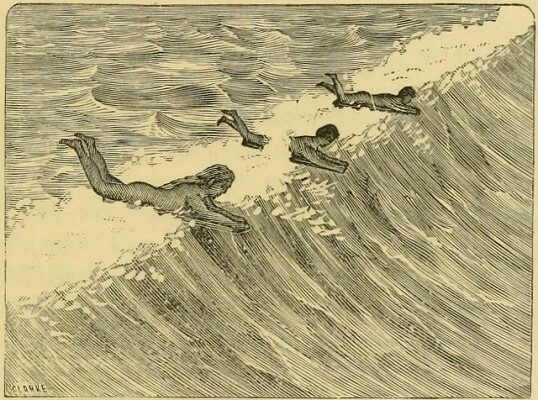 These difficulties were circumvented with the development of surf photography, which would play a major part in the spread and evolution of surf-riding. - surf-riding is represented as a community activity. - the riders adopt a variety of riding positions and significantly they illustrate stance - a feature not noted in the early written accounts. - the artist makes a significant attempt to accurately portray the wave shape and action and there is often an indication that the activity is in off-shore conditions - considered best by surf-riders. - in most cases the wave size is less than six foot and board length is less than seven foot. This is probably a result of observing a large number of riders close to shore. 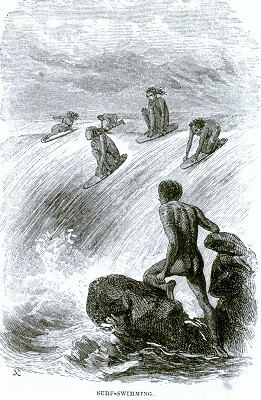 In some instances, other riders are located much further from shore than the central figures, probably indicating they were riding larger waves and possibly with larger boards. Some images feature bare female breasts, undoubtedly of interest to 19th century readers. Generally, the more this feature is detailed then the less informative the illustration. 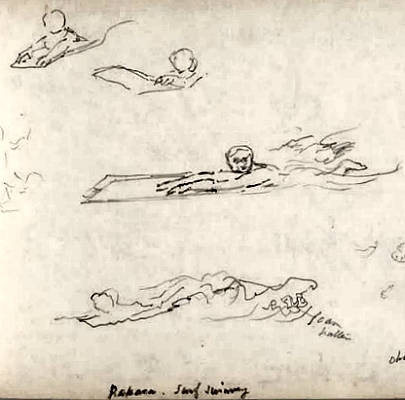 Although not in common circulation, the significance of unpublished paintings and drawings should not be overlooked. It is possible that the artists responsible for the printed images had some access to the former, and may have been influenced by them. This may be of extreme importance to some artists who apparently never visited Hawaii and their work, unless taken from a previous work, can only be a construction from a published text, field notes and/or verbal input. 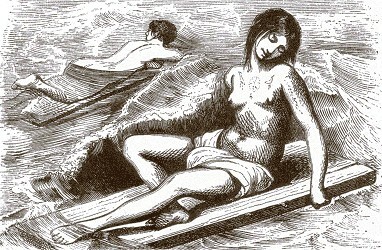 For example, see Bayard (1873) and Riou (1873), below. The second in particular, has some significant inconsistencies. 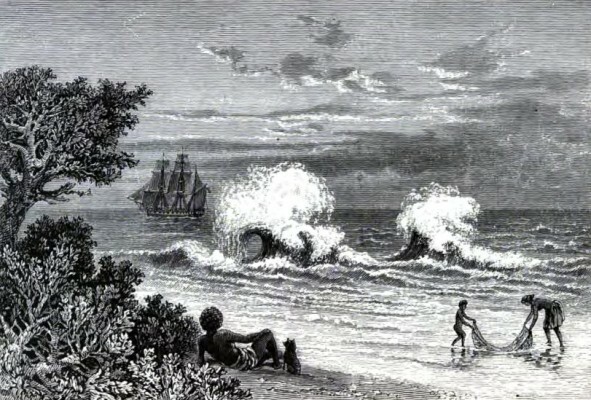 Breaking Wave, Matavai Bay,Tahiti, 1769. 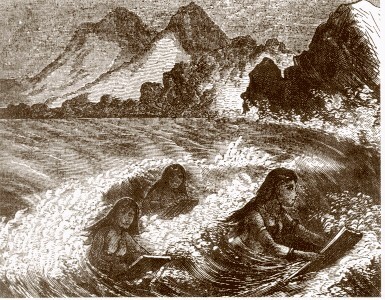 Detail from Purea's canoe, Tahiti, 1769. 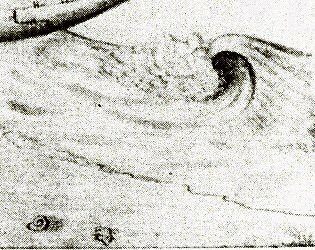 Volume 1, Figure 31, between pages 112-113.
wave face that is integral to the dynamics of surfriding. 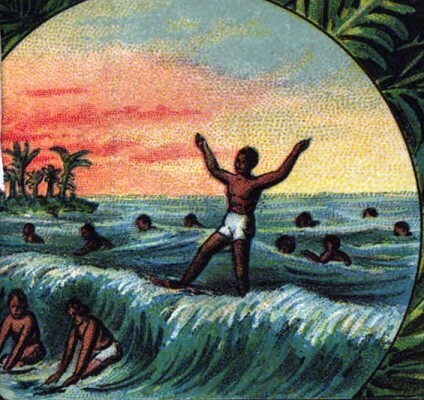 The first known image of a surf board. John Webber:"A View of KaraKakooa, in Owyhee, 1778." 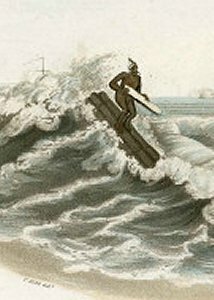 Catamaran surfer, Madras, India, 1800. 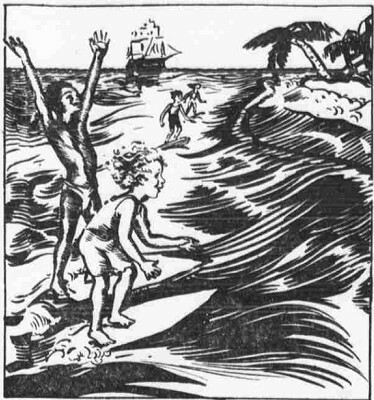 The earliest known image of surf riding. Collection Purchased with USA Bicentennial Gift funds. 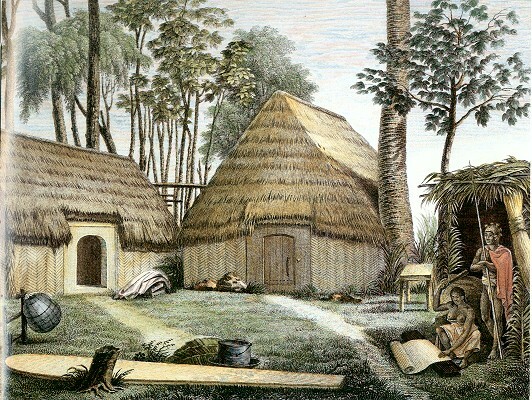 The Houses of Kraimokou, circa 1819. 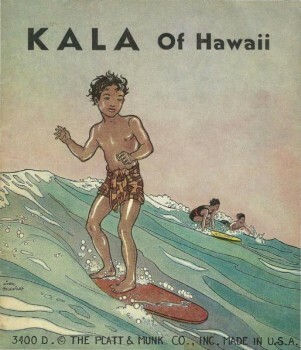 Often cited as "First image of an olo surfboard." Voyage autour du mode, 1817-1820. Chez Pillet aine, Paris, 1825. Volume 2, Part 2, Book 4, Chapter XXVII. Lueras: Surfing (1984) page 35. It may or may not be intended to illustrate surf riding. 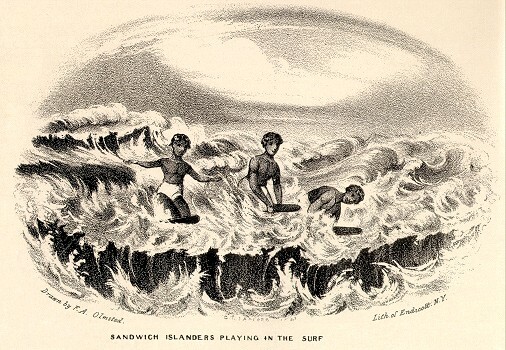 Surf Swimmers, (Sandwich Islands), 1830. 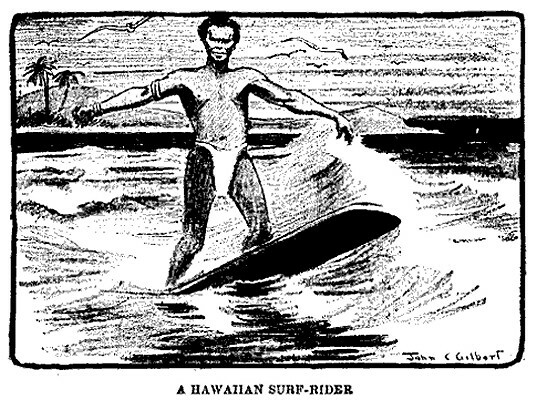 Often cited as "The first Western image of surf-riding." Fisher, Son and Jackson, London, 1831, frontpiece. 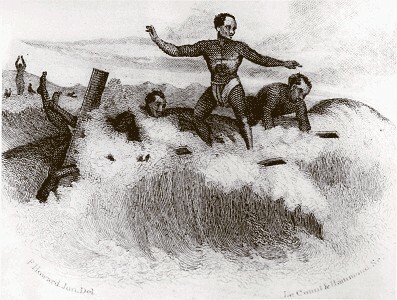 Sandwich Islanders Playing in the Surf, 1841. 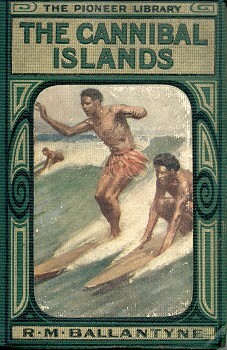 First image of surf riding by the same author and artist. Incidents of a Whaling Voyage. Appleton and Co., NY, 1841, facing page 223. 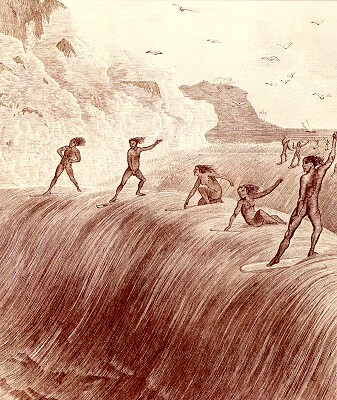 Hawaiian Surfing, Hilo Bay, Hawaii, circa 1850. Lueras : Ultimate Pleasure (1984) page 48. Mr. and Mrs. Don Severson Collection. Lueras notes: "The oil painting ... was painted on a biscuit tin ... by an unknown artist who visited Hawaii about 1850. The work was recently discovered in a New York art gallery by a Honolulu antiquarian who has since returned it to Honolulu." -page 49. 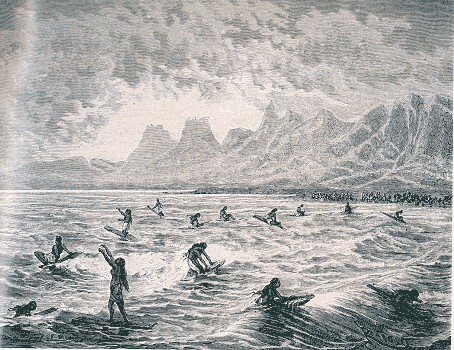 Hawaiian Sport of Surf Playing, 1851. 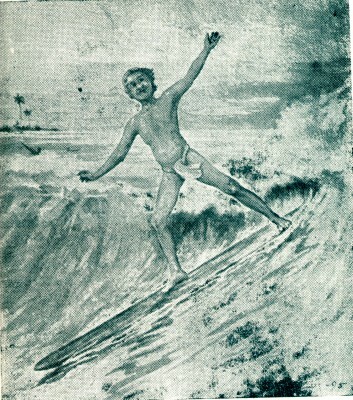 First surf riding illustration published in a magazine. Volume IV, Number III, October 1851. Life in the Sandwich Islands. 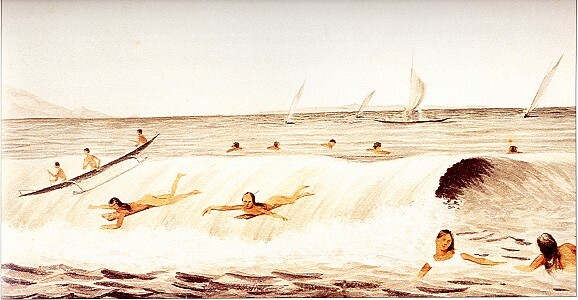 Surfboard, a bathing scene, Lahaina, circa 1855. Thom: Surfmovies (2000) page 5. 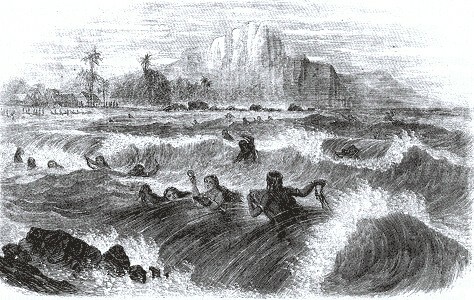 Surf Swimming off the Coast of Hawaii, 1863. S.O. Beeton, London, 1863, page 96. 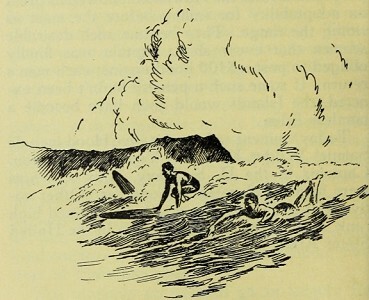 7 April 1866, page 37.
duck-diving, waves in sets, off-shore winds and significant wave height. This is very similar in composition and style to Wallis McKay (1873), see below. or this artist was influenced her work. The Uncivilized Races of Men in all Countries of the World. American Publishing Company, Hartford, 1872. 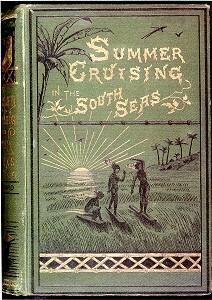 Summer Cruising in the South Seas. Although not accredied in the text, the book's illustrations are recognised as by Wallis McKay. See DeLaVega: Surfing Bibliography (2004) page28, and below. This etching is initialled W M in the left corner. Chatto and Windus, London. 1873, frontpiece. 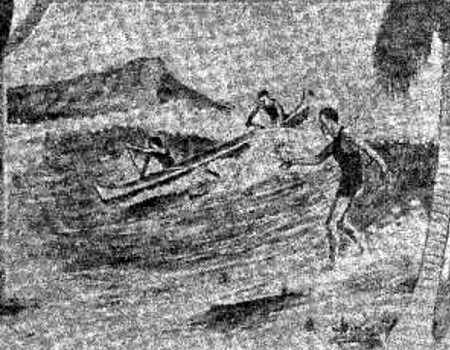 Surf-Swimming, Norfolk Island, circa 1873. London, 1873, facing page 64. 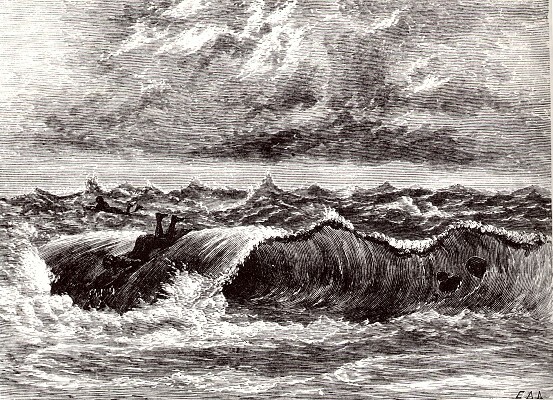 "Voyage Aux Iles Sandwich (Iles Havai)"
Volume II, 1873, page 224. .Probably reconstructed from reports or sketches. Volume II, 1873, page 237. Note that some of the surfers appear to be riding away from the beach. 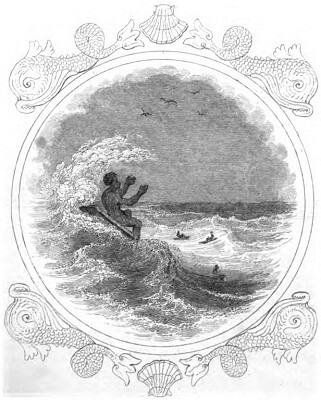 R. Richardson: South Sea Islanders in Canoe. Man on the Ocean; A Book about Boats and Ships. 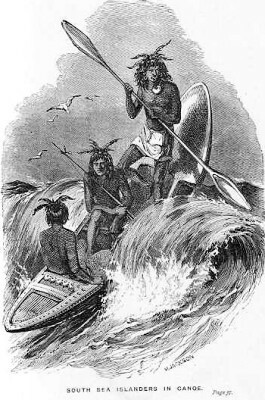 Note that this is not, as would be expected, an outrigger canoe. and the crew member facing to the rear. From a definitely elevated perspective. 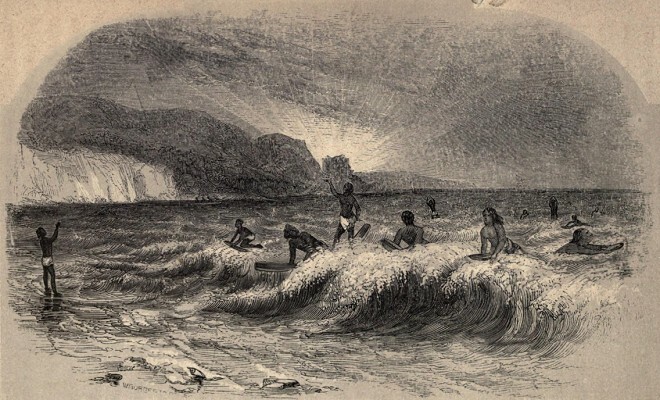 Jay Charlton : Natives Bathing In The Surf Near 'Newport' Three Miles From Honolulu, Towards Diamond Head, 1875. Printed with the article "King Kalakaua at Home"
Leslie's Illustrated Weekly, 23 January 1875. Pellion's The Houses of Kraimokou, (circa 1819), see above. Young: History (1983) page 18. 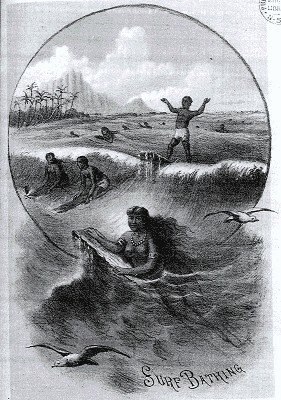 The Natives Playing in the Water, 1880. 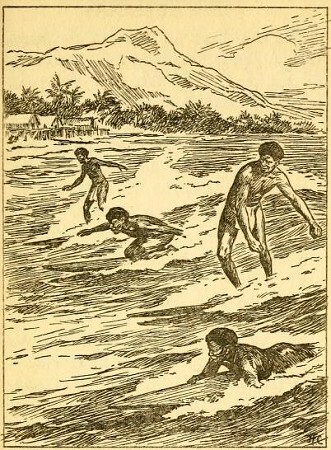 It is possibly the geography book illustration recalled by John R. Musick on observing the surfboard riders at Kailua, Hawaii, in 1898, see below..
Perhaps borrowing from Musick, in 1908 Alexander Hume Ford wrote of a similar geography book inspiring his schoolboy dreams of surf riding in his article, Riding Breakers. 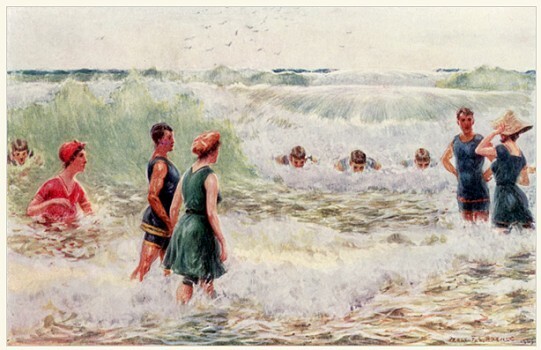 Ford would virtually replicate the scene, including the grass huts, with the establishment of the Outrigger Canoe Club on Waikiki Beach in 1908. A Coral Island in the South Pacific, 1885. 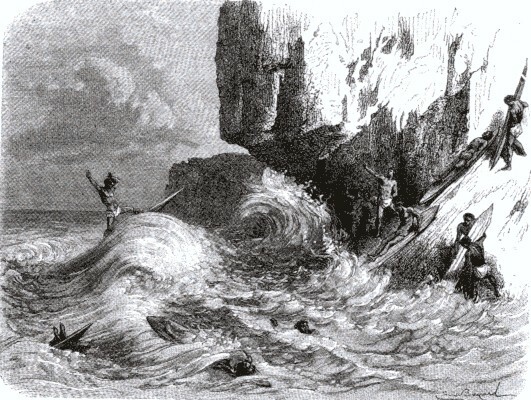 While not showing surf riding, this is a very dramatic illustration of large waves breaking on a coral reef. 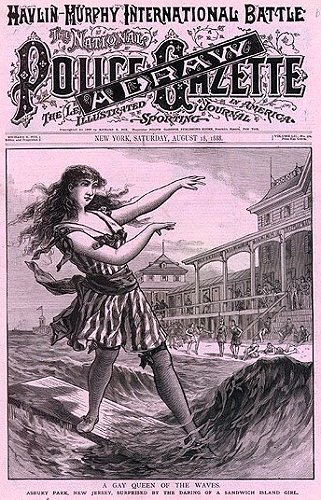 A Gay Queen Of The Waves, 1888.
by a newspaper renowned for manufacturing content. Karst: Scene in Polynesia (1881), above. Margan and Finney: Pictorial History (1971) page 25. 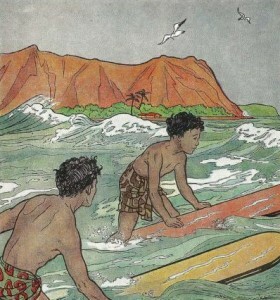 Oceanic Steamship Company, San Francisco, 1895, page 35.
same publisher, Surf Riding, Hawaii,1890, was cropped. are not evident in the colourized version. 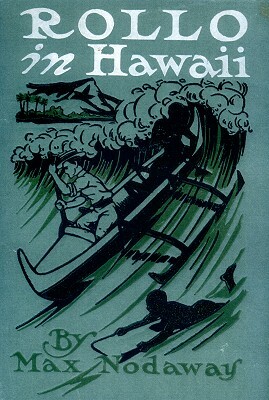 For the cover of the 1897 edition of A Trip to Hawaii, see below. Detail from a colour advertisement for J. D. Spreckles and Co.
and the Oceanic Steamship Company. 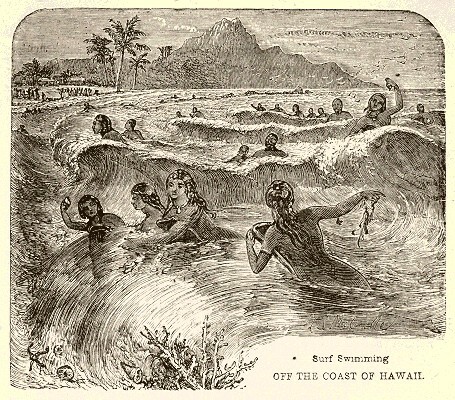 Hawaiian Surf Bathing, circa 1890. Whitney, Henry M. (editor) . 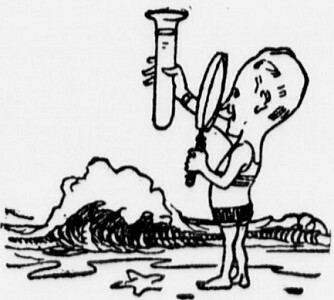 The Hawaiian Gazette Co., Honolulu,1890. Landing in a Surf boat at Accra, 1891. 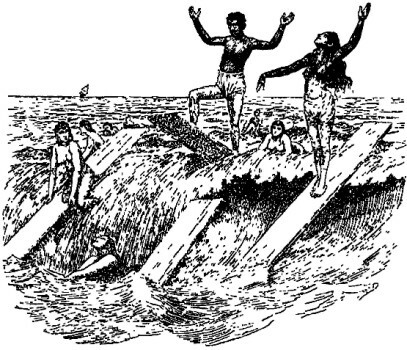 Papara - Surf swimming, 1891.
earlier described by Daniel Wheeler in 1835. Noted by Herve Manificat, The Surf Blurb, 24th February 2013. 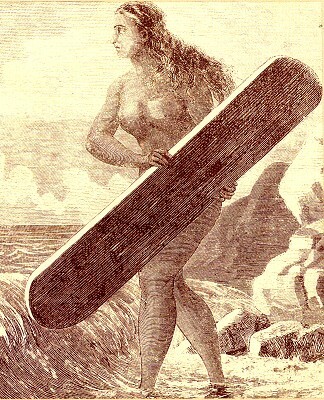 In the text the surfboard is called a "sea sledge,"
Kelea, the Surf Rider of Maui, 1894. Sydney, 24 March, 1894, page 3. 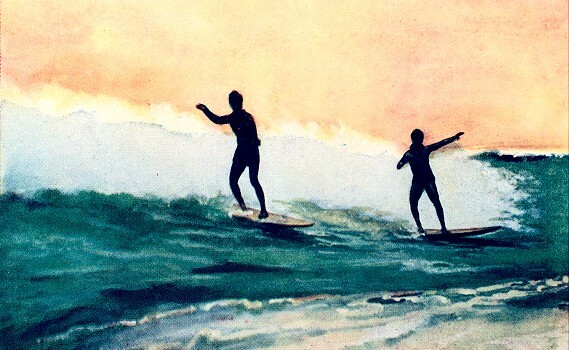 Header to the article Hawaiian Surf-riding. 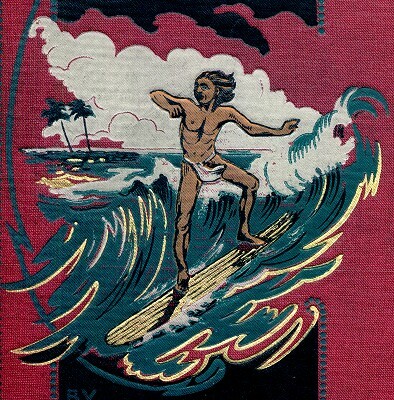 Thrum 's Hawaiian Annual of 1896. 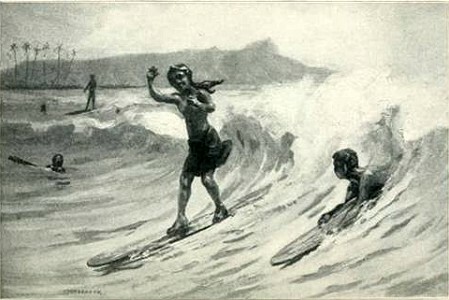 "Surf-riders at Waikiki, circa 1890s." George: Surfing (1990) page 20. A Trip to Hawaii, 1897. Oceanic Steamship Co., San Francisco, 1897. 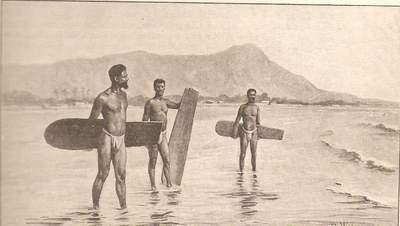 Native with Surf Board, Waikiki Beach, circa 1898. Hawaii - Our New Possessions. Funk and Wagnalls, New York, 1898. The image was also reproduced in black and white plate, facing page 72.
and I said: "It was true." and posted on The Surf Blurb, 24 March 2013. (in this case) by Charles Kauha photos." Weisser "never went to Hawaii and apparently was inspired (in this case) by the 1892 Oceanic steamship brochure A Trip to Hawaii, written by Charles Stoddard," see above. Putman, New York, April 1899. 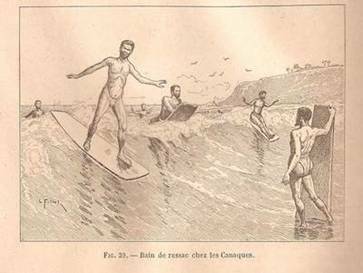 John F. Campbell: The native surf-riders [Nuie]. 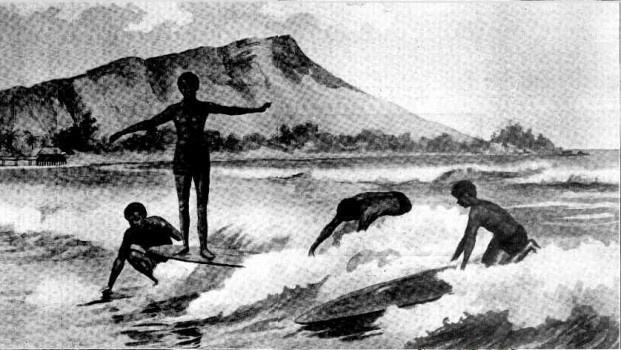 Although the illustration accompanies text describing surfriding in Nuie in 1867, it was almost certainly drawn from an early Hawaiian photograph, with what is clearly Diamond Head in the background. George Dorian Company, New York, , page 21. Identified by Herve Magnificat, The Surf Blurb, May 5, 2014. A. Flanagan Company, Chicago, 1900. Alice's Visit to the Hawaiian Islands. American Book Company, New York, 1900. 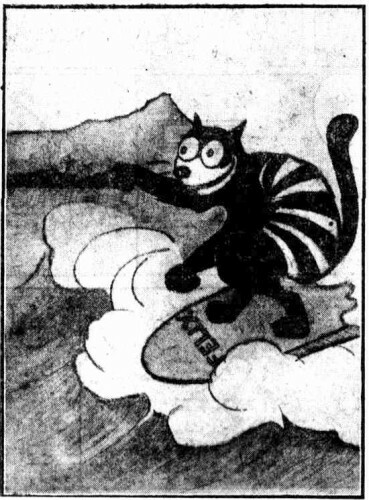 Vuibert and Nony, Paris, 1905.
on The Surf Blurb, 24 March 2013. "The illustration by Fillol, a French illustrator of popular books, ... is a combination of both Charles Weisser’s pictures shown above." 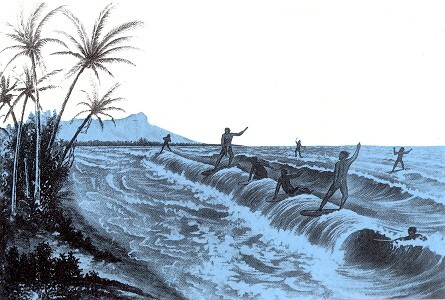 Surf-riding at Diamond Head., 1905.
this design was adopted by the County Board of Oahu in July 1905. 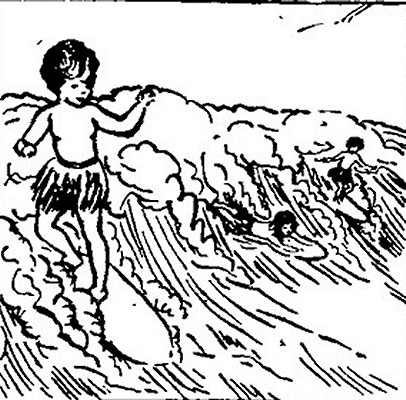 The Favorite Sport of Surf-Riding, 1907.
on The Surf Blurb, 4 June 2013. 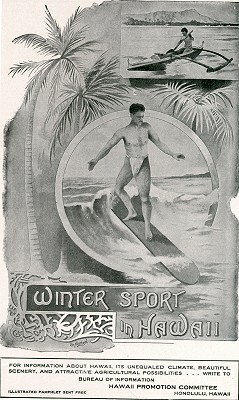 Winter Sport in Hawaii, 1908. 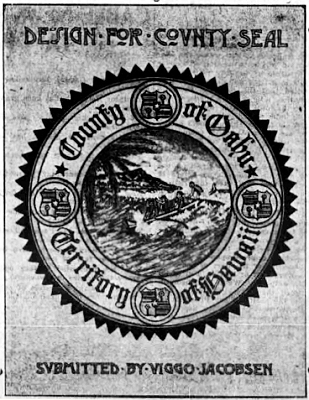 Advertisement for Hawaii Promotion Committee. April 1908 Vol. XIX No. 4, page 309. 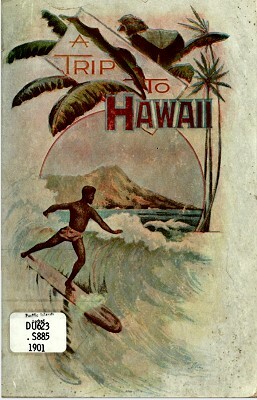 Hawaii Promotion Committee, Honolulu, 1908, 4th Edition. 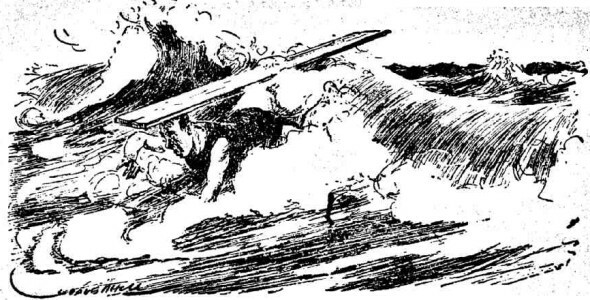 Canoe and Board Surf Riding, 1908. Thompson and Thomas, Chicago, 1908. London, Gay & Hancock, 1910. 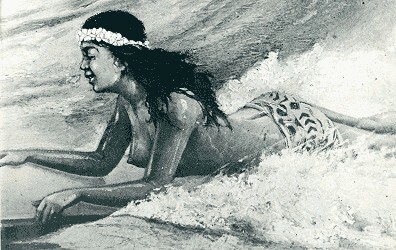 The South Pacific Heroine, 1911. (Ralph Stock): The Recipe for Rubber - A Romance of the South Pacific. Boy's Own Paper Office, London, 1921-1922. Surf Bathing - Shooting the Breakers, 1911. 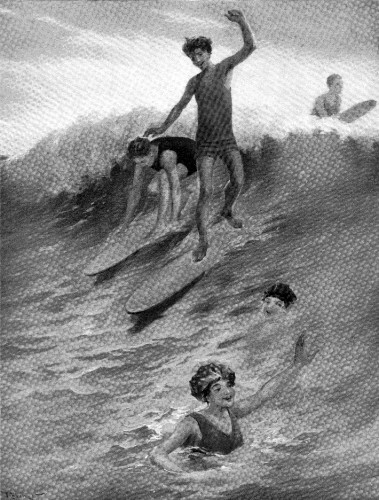 Riding the Surf at Honolulu, 1912. 25 December 1912, page 30. American Book Company, New York, c1912. Part 1 : the Hawaiian collections. 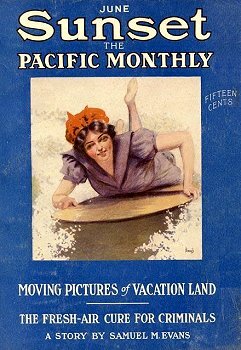 Bishop Museum Press, Honolulu, 1915. "I'm almost sure this isn't a bit the way its done in the illustrated papers!" Sydney, Saturday 22 August 1914, page 15. M. A. Donohue and Company, Chicago, 1915. New York, July 17, 1920, page 8. 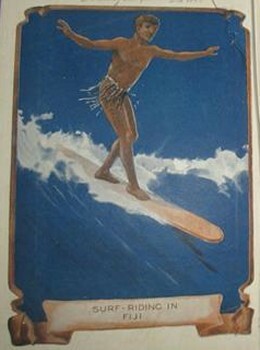 The nose-riding surfer is an abberation, resulting from King's misreading of a hand-coloured photogragh postcard of the era. Ski-ing the Waves of Waikiki, 1921. Surfboard riders displaying their skill in the always summery waters of Honolulu's world famous beach resort. A Souvenir of "The Crossroads of the Pacific." Rogers Peet Company, New York. New York, June 28, 1921, page 17. April 1, 1922, page 45.
and was printed in several magazines during 1922. 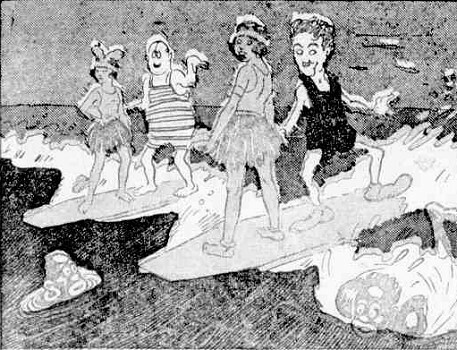 New York, June 10, 1922, page 15.
with two damsels at Waikiki. Sydney, Sunday 1 January 1922, page 1. Felix tries the surf-board at the beach of Waikiki. the Radio Adventure talk at Farmer's recently. Sydney, 22 August 1926, page 2. 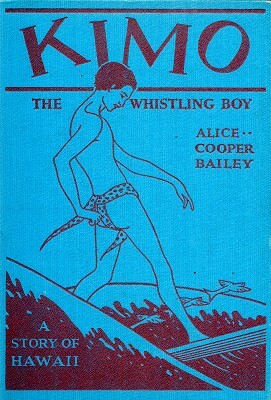 Kimo - The Whistling Boy, 1928. 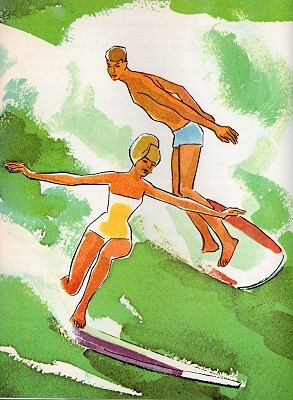 There are two other surf riding illustrations within the book. Surf Riding, New Zealand, 1929. The Adventures of Dickey Possum, Chapter IV. 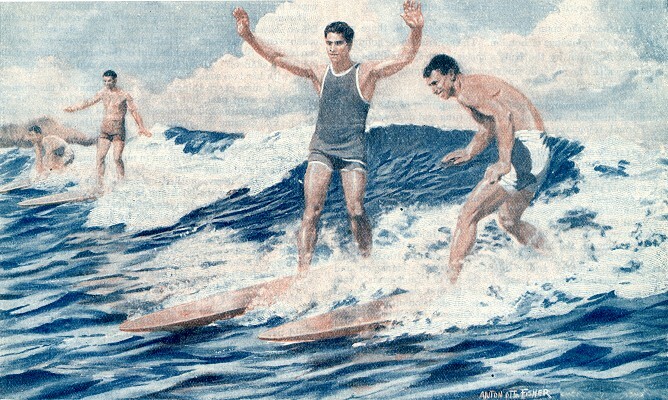 Unaccredited : Surf Riders, 1929. Sydney, 16 October 1929, page 9. 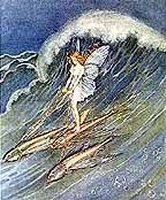 Ida Rentoul Outhwaite : Surf Riding Fairy and Flying Fish, 1930. Outhwaite, Ida Rentoul: Bunny and Brownie, Black, London, UK, 1930, page ?. Hawaiians find time for play, 1945. 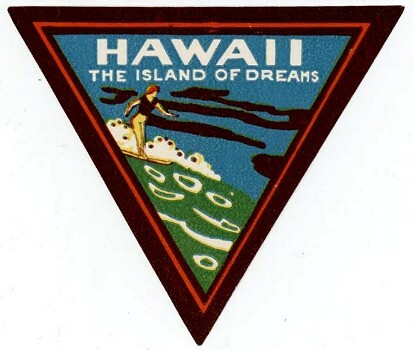 Long before Pearl Harbor; Hawaii's Historical Highlights. Honolulu Star-Bulletin, Honolulu,1945, page 36. "1903 - Nov 2 : Daily Mirror launched by Harmsworth. First daily illustrated exclusively with photographs." "1934 - Oct 18 : Daily Mail publishes the first photograph to be transmitted by beam radio (from Melbourne to London)." Bolton, Dr. Henry Carrington (1843-1903) : "Some Hawaiian Pastimes"
Originally presented at the annual meeting 11/28/1890, along with "projections of the original photographs." No photographs in the article. 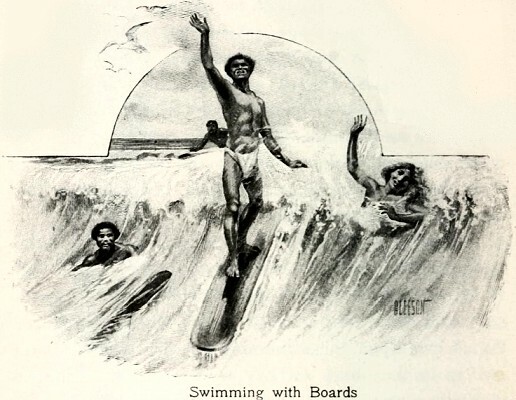 Dr. Bolton documented and photographed surfing, as well as surfed on Niihau. Of note is that he noticed how different surfing actually was from its popular description. "As commonly described in the writings of travelers, an erroneous impression is conveyed, at least to my mind, as to the position which the rider occupies with respect to the combing wave." 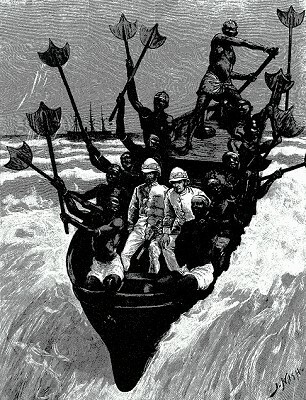 (Bolton quotes and compares Jarves, Isabella Bird and G. Cummings and points out the impossibility of the surf-riders position in Nordhoff's etching.) - see 7 below. "Some pictures, too, represent the surf-riders on the seaward slope of the wave, in positions which are incompatible with the results. I photographed the men of Niihau before they entered the water; while surf-riding, and after they came out. 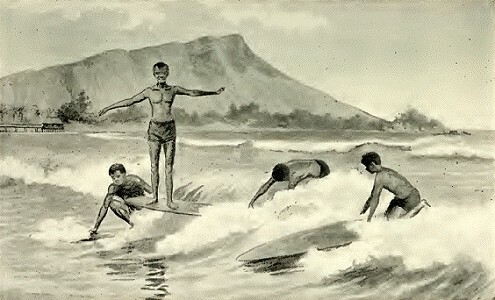 The second view shows the position taken (Photographs exhibited)..."
Referred to by Tom Blake in Hawaiian Surfboard. DelaVega (ed, 2004) page 12. HARPER'S WEEKLY. LONG BRANCH: THOMAS NAST BEACH SCENE. An original 16-inch by 22-inch, hand-colored print- drawn by famous illustrator Thomas Nast- from the August 26, 1865 issue of Harper's Weekly magazine. Entitled: "Our Watering-Places- Views At Long Branch." The double-page engraving depicts seven separate scenes, among which are the sea side, pavilions, lovers on the beach, children in the surf or playing, and an evening in the parlor.